2 or more 30% $11.97 per pc. White shower curtains include a selection of different stylish and custom-made designs for your bath decoration. Trippy Digital Shapes Shower Curtain in White category will add a chic and creative decor element to your bathroom with its bright Violet color. With different size options from 69x70 to 69x84, unique shower curtains collection by Ambesonne is accessible by everyone with its affordable price. 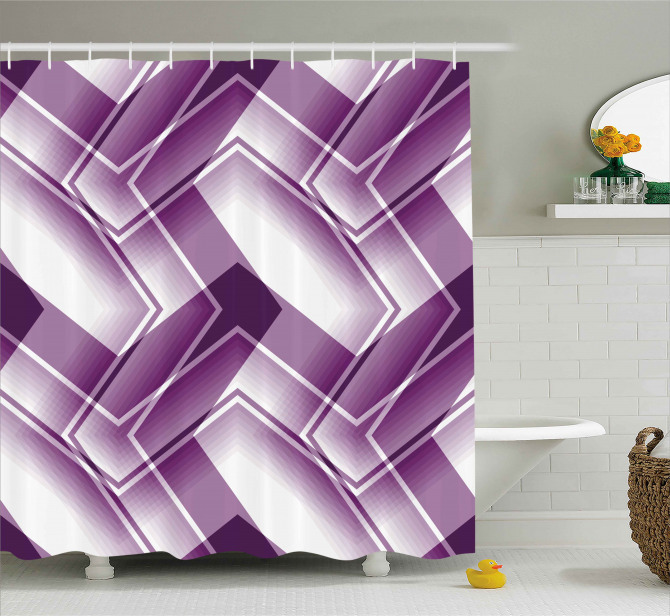 White themed Trippy Digital Shapes Shower Curtain will create a brilliant atmosphere in your bathroom with the only $39.90. As an online shower curtain shop, Ambesonne offers you hundreds of fashionable bathroom curtains for every style. Buy now the high-quality bath curtains, prepared by 3D printing technology and enjoy your dream decoration in the bathroom. Online this shower curtain looks beautiful. But I had many reservations before I bought it. I was afraid it would come in different color but that was not the case. Colors are true to life to this day. Workmanship in the curtain is nice and it shows. It looks like a durable addition to my washroom. It looks great now with my other complementary parts. Image and curtain is really good and looks well made. Fabric does not feel cheap and you can tell it is mold resistant. It comes with hooks so this is always a plus but those did not do it for my bathroom so I went and get some new ones. People coming my washroom generally likes this drape and compliments me on it regularly. Well-made beach themed shower curtain. My only gripe with drape is it does not have weighed bottom. We have a small window in our bathroom but little light that coming from that source is enough to make this a bright and inviting decorative element in our bathroom. We have a large mirror in the opposite of the shower so it really expanded the size of the washroom. What is more mood heightening than walking into a shower with a cool beach landscape. We also added a lightweight liner for extra privacy but you do not need to do that. I just love the durable material of the shower curtain. Its lightweight and perfect for my small bathroom. At first children did not like the pattern but at the end they too started to like it. You can be assured that it is mildew and mold free. Most of the water just slides through anyway. It is a really great product. And I would recommend it to anyone. I have a small bathroom I thought this shower curtain would make it seem smaller but that is not the case at all. Rather than taking up more space it gave more space to my bathroom. Colors are perfect and the quality is there for the naked eye. You do not need to inspect it closely to see that it is a good product. Adds a great calming atmosphere to the bathroom. I love that from the inside of the shower curtain, especially with the lights dimmed, it feels like I'm bathing in the ocean. Material is very lightweight, so I'd recommend plastic shower curtain rings. The holes at the top are not reinforced very well (less reinforced than shirt button holes), so I think metal shower rings might stress them too much over time. Since the curtain is so lightweight, it should be fine with plastic rings. Something I didn't notice when purchasing--there is a small city skyline at the edge of the water. Not a huge deal, but evokes a slightly different feeling than just looking out into an infinite ocean. Photo quality is not amazing, but it's plenty good enough and what you'd expect at this size on a shower curtain. Overall happy with the purchase at the price.